The current wrangling on Capitol Hill over the so-called Dreamers has come down to the usual political deal-making. Trump has signaled he's willing to compromise on deportations - that is, initiate fewer of them - if he can get funding for his border wall. Also at issue is whether or not Dreamers already in the US ought to be able to sponsor their parents for legal residency or for citizenship. Dreamers are current illegal immigrants who were brought to the United States as children. Opposition to deportation of the Dreamers - especially those who are still minors - has been significant, with much of the opposition geared around the idea that some minors are being deported to foreign countries where they don't even know the language or local culture after having been in the US for most of their lives. On the other hand, support for deportations has centered on fears that allowing the Dreamers to stay in the US will encourage a new influx of immigrants who will in turn become citizens quickly and unduly influence the political system. Also at play is the concern that some immigrants are a net drain on social welfare benefits and on other government-provided amenities such as public schools. 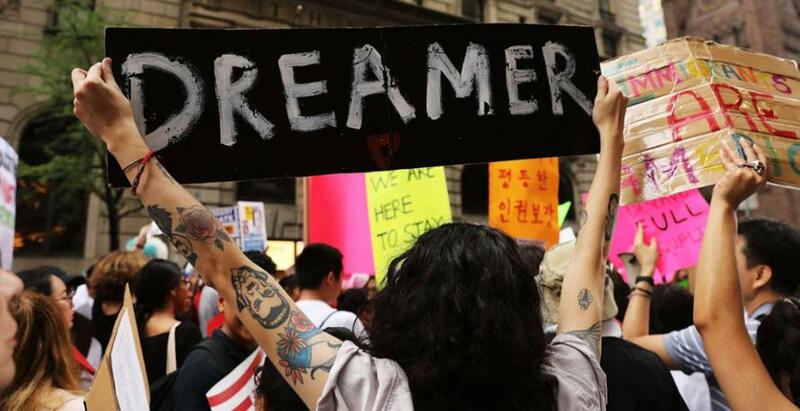 Is There a Laissez-Faire Approach to the Dreamers? For many Americans who are concerned with freedom and free markets, the solution to this situation has sometimes not necessarily been clear. Is there a way to address immigration issues without doubling down on more government power and more government spending? No deportations are required to enforce this measure. In practice, all that is needed is for governments to take no action. That is, they don't offer services to non-citizens. But even if immigrants were denied all social benefits and had their own privately-funded schools and hospitals, we'd likely still hear opposition to immigrants on the grounds that immigrants will use their numbers and the ballot box to force their own preferences on the rest of the population. The issue of migrating minorities overwhelming a majority in a host country is a real issue, and there's a reason it was discussed by Ludwig von Mises in his book Liberalism 90 years ago. In North America, however, this scenario is by no means guaranteed since immigrants of past migrant waves — most of whom were from authoritarian states — showed little interest in imposing the sorts of regimes they were used to. Indeed, in the late nineteenth century, immigrants tended to affiliate with the Democratic party which, at the time, was the party of decentralization and greater laissez-faire. But, even if the fear of cultural imperialism via the ballot box were well-placed, mitigation of the problem would not require the violation of property rights via measures such as deportation or regulation of the labor force. Since non-citizens cannot vote, the use the ballot box to overwhelm the current cultural status quo requires citizenship. The issue can be addressed by simply declining to expand citizenship in certain cases. Moreover, there is no property-rights principle which dictates that residents of a place must also be granted citizenship by the local civil government. Citizenship is, after all, essentially just a permit to engage in certain political activities, and — properly understood — is separate from the ability to be secure in one's own property. While the current interpretation of the US Constitution is that all native-born persons are citizens, a civil government does not violate the property rights of migrants by declining to offer citizenship. The government is simply taking no action. Deportation, on the other hand, is a violation of property rights and is a type of government intervention. It often voids contracts between landlords and tenants, employers and employees, and cuts off persons from access to their own property. Deportation in practical terms often has the same effect as confiscating a person's legally-obtained property. Worst of all, the enforcement of laws designed to regulate the migration of persons often leads to what Lew Rockwell has called the tragedy of immigration enforcement which occurs when native Americans are punished for the "crime" of doing business with migrants who have not been granted the arbitrary status of "legal" by federal bureaucrats. Much of the fear behind a migrant-voter connection in the US stems from the fact that many Americans realize it is exceptionally easy for residents of the US to obtain citizenship. For most legal immigrations, five years of residency is all that is required. In some cases, such as for immigrants married to citizens, only three years of residency is required. We could contrast this with Switzerland where new regulations require that potential new citizens not receive social benefits, be proficient in a Swiss language, and have been legal residents for ten years. Additionally, there are local mandates on top of these federal mandates, and citizenship may be even more stringent at the cantonal level. All of this citizenship business, however, is separate from the matter of legal residency. In both the US and Switzerland, people may become permanent residents without ever obtaining citizenship. These people are free to continue to open businesses, earn a living, raise a family, and travel. They enjoy legal constitutional protections, since, as Judge Andrew Napolitano has pointed out, lawful residents have "the same rights, except for voting and running for office, as the rest of us." Due process is guaranteed to all persons under the US constitution, not just citizens. This is a good thing. On the matter of the Dreamers, the "moderates" ought to be staking out a position in which the government does virtually nothing at all. Under this scheme, the federal government doesn't round up the Dreamers and deport them. It also avoids the issue of breaking up families and violating property right with deportations. But at the same time, the federal government does not extend citizenship to the people in question. In other words, do nothing - and nothing has always been a good thing for the federal government to do.